Facebook on Wednesday announced a new video chat capability it will roll out in conjunction with Skype, in what the social-networking giant said is the first of many announcements of new applications to come in the next couple of months. Users will be able to click a button in Facebook to call a friend. If the friend does not already have the plugin required for video chat, the friend will see a pop-up to download the plugin. That download should just take 10 or 20 seconds, said Mark Zuckerberg, Facebook’s CEO, during a webcast press conference on Wednesday. 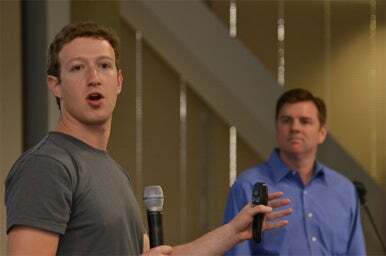 Facebook CEO Mark Zuckerberg, left, and Skype CEO Tony Bates at the launch of Skype-based video chat on Facebook, on Wednesday. Zuckerberg described Facebook as a platform that allows these kinds of new applications to be easily used. He also sought to set Facebook apart from competitors because Facebook plans to partner with companies like Skype that are focused on specific technologies. That may have been a dig at Google, which recently launched its own social-networking service that includes features primarily built by Google. Later on, Zuckerberg addressed the Google+ social-networking site, which is in a closed beta test but is earning a lot of positive buzz, saying that it’s consistent with companies of all stripes tapping into the social-networking wave, whether partnering with existing social-networking sites like Facebook or trying to build their own social graph. While moves such as the one by Google validate that social networking is a ubiquitous, mainstream activity, the next phase in the market will be to leverage the social graphs through innovative applications like Skype’s, he reiterated. Zuckerberg and Skype CEO Tony Bates said that the two companies are already considering adding more Skype features and services on Facebook, including possibly premium fee-based services such as voice-over-IP telephone calls, but that the next step hasn’t yet been decided. For example, video chat, which is now limited to a one-on-one connection, could be opened up so that more people can participate simultaneously, although most people prefer to limit their video chat sessions to two participants, they said. “One-on-one is the most important part of video chat,” Bates said. Google+ has a feature called Hangouts that allows for multiple video chat participants. Bates, whose company is in the process of being acquired by Microsoft, a close Facebook partner, also said that partnering with Facebook “makes a lot of business sense” because it helps with Skype’s core strategy of making its services as broadly available as possible. In addition to video chat, Facebook also said it plans improvements to its group chat function and will roll out a new design for its text chat interface. IM-like text chatting is one of the most popular activities on Facebook, but it hasn’t been the most intuitive feature to find and launch, so Facebook is introducing a more prominent sidebar showing the people a user chats with the most, Zuckerberg said. For Groups, Facebook is making it possible for a member to initiate a multi-user text chat session with one click in an ad-hoc manner and invite other members to participate. Zuckerberg also confirmed that there are 750 million Facebook users. Future growth, however, won’t be measured by number of users but by how much people share on Facebook, he said. Currently, users share 4 billion things every day, he said. Facebook plans to continue to announce new features that will encourage people to share even more in the future, he said. Update at 2:55 p.m. PT with comments from Mark Zuckerberg and Tony Bates.